The QNX Neutrino RTOS is a full-featured and robust OS that scales down to meet the constrained resource requirements of realtime embedded systems. Its true microkernel design and its modular architecture enable customers to create highly optimized and reliable systems with low total cost of ownership. It offers the embedded industry's only field-proven, clean strategy for migrating from single-core to multi-core processing. Because every driver, protocol stack, filesystem, and application runs in the safety of memory-protected user space, virtually any component can be automatically restarted if it fails. The QNX Neutrino RTOS (realtime operating system) is so reliable because it is a true microkernel operating system. Under QNX Neutrino, every driver, protocol stack, filesystem and application runs in the safety of memory-protected user space, outside the kernel. Virtually any component can fail - and be automatically restarted - without affecting other components or the kernel. No other commercial RTOS offers this degree of protection. The QNX Neutrino RTOS has a field-proven strategy for migrating from single-processor to multi-processor embedded environments. Its unique bound multi-processing (BMP) technology takes the risk out of migration by enabling developers to decide exactly where every process and thread will run. The QNX Neutrino RTOS offers great economic and technical advantages thanks to its ability to extract extremely fast, predictable response times from inexpensive embedded hardware. Since 1980, manufacturers have relied on QNX RTOS technology to power their mission-critical applications - everything from medical instruments and Internet routers to telematics devices, 911 call centers, process control applications, and air traffic control systems. Small or large, simple or distributed, these systems share an unmatched reputation for operating 24 hours a day, 365 days a year, non-stop. Time-tested and field-proven, the QNX Neutrino RTOS sets the industry standard for reliability, fault tolerance, and scalability. The QNX Neutrino RTOS provides a level of fault containment and recovery offered by no other commercial RTOS. 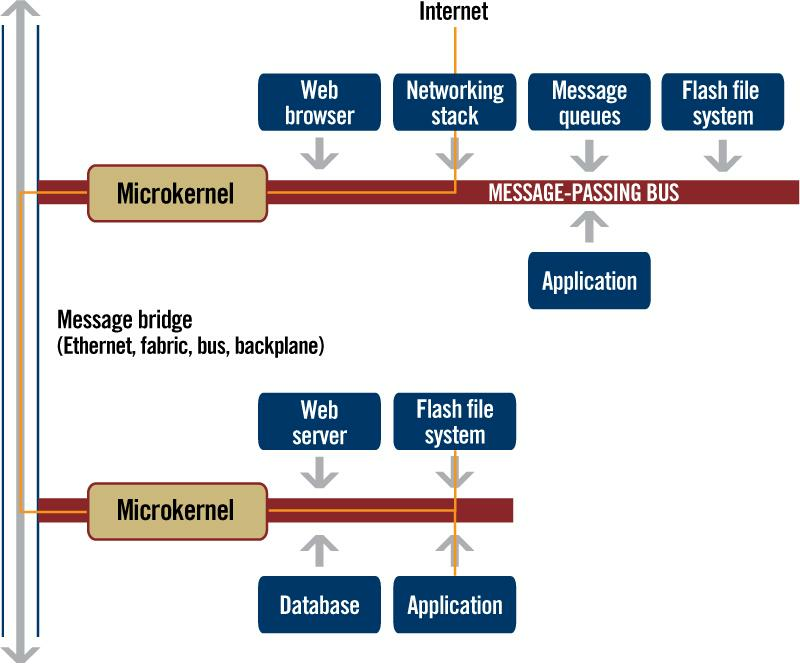 Its microkernel architecture has every driver, protocol stack, filesystem and application run outside the kernel, in the safety of memory-protected user space. Virtually any component can fail and be automatically restarted without affecting other components or the kernel. The same RTOS, tools, APIs, and source code are used for developing and implementing systems to meet all manner of requirements for single-processor and multi-processor systems, large and small. QNX adaptive partitioning technololgy can guarantee system resources for all applications as needed. Under normal operating conditions it allows applications to use all available CPU cycles, but during overload conditions, it enforces hard resource guarantees, ensuring that all applications receive their budgeted share of resources. The QNX Neutrino RTOS supports a broad range of x86, PowerPC, ARM, MIPS and SH-4 platforms. The resource manager framework, which, unlike conventional drivers, runs in memory-protected user space, simplifies driver development for custom hardware. The QNX Neutrino RTOS is a full-featured and robust OS with a number of unique technological features that set it apart from all other competitive products. The QNX Neutrino RTOS provides deterministic response times at the application level and in all subsystems. Thread priority inheritance eliminates priority inversion problems. Thanks to the microkernel architecture of the QNX Neutrino RTOS, virtually any component - even a low-level driver - can fail without damaging the kernel or other components. What's more, failed components can be restarted quickly and intelligently. With the QNX Neutrino RTOS, spare CPU capacity is used when available. If resources are constrained, processes get their budgeted share. If, however, a system has spare cycles, processes can exceed their budget limits. If a device driver, protocol stack, or application experiences a problem, it does not take other components down with it. The QNX Neutrino RTOS high availability manager can terminate and restore the faulting component in isolation - often in just a few milliseconds without a reboot. QNX filesystems execute outside the microkernel in memory-protected user space. Developers can start, stop, or upgrade filesystems on the fly without having to reboot. Multiple filesystems can run concurrently on the same target and even work in concert to extend one another's capabilities. Runtime support and BSPs for popular chipsets, including ARM, MIPS, PowerPC, SH-4, and x86, lets designers select the best hardware platform for their embedded system, then quickly get their systems up and running. With its pre-emptible microkernel and priority-based preemptive scheduler, the QNX Neutrino RTOS delivers response times that are both fast and highly predictable. High-priority threads can meet their deadlines on time, every time, even under heavy system load. The QNX Neutrino RTOS is a true microkernel operating system and, as such, the microkernel includes only the most fundamental services, such as signals, timers and schedulers. All other components - filesystems, drivers, protocol stacks, applications - run in the safety of memory-protected user space. Fault resilience is built right in. All OS components communicate via a single, well-defined messaging layer. This messaging layer forms a virtual "software bus" that permits the addition - plug in - and removal of software components at any time. Messages flow transparently across processor boundaries, providing seamless access to any resource, anywhere on the network. 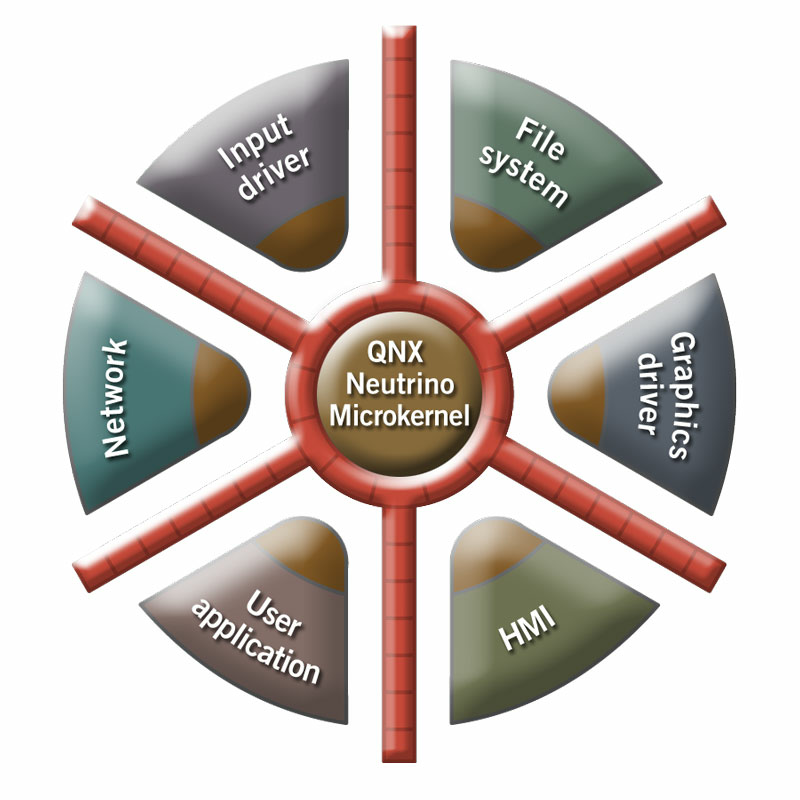 The QNX Neutrino RTOS microkernel isolates processes in memory-protected user space. QNX adaptive partitioning is a simple, reliable solution for processor-intensive systems where task starvation is not an option. It ensures that critical processes are never starved of resources and always meet realtime deadlines. Adaptive partitioning eliminates the over-engineering required by fixed-partitioning designs, which waste unused cycles and force designers to use more-expensive CPUs. It thus both improves product time to market and does away with the complex task-starvation problems that typically arise during a project's integration phase. QNX adaptive partitioning offers applications unused CPU capacity while guaranteeing required CPU cycles to critical processes. QNX adaptive partitioning is a unique partitioning approach. It provides minimum CPU time guarantees to partitions (sets of processes or threads), while allowing partitions to exceed their time budgets when spare processing cycles are available. The system designer can reserve a percentage of processing resources for a specific partition. Under normal operating conditions, partitions can use whatever CPU cycles are available. However, during an overload, that is, when more computation is required than the system can sustain over time, the QNX adaptive partitioning scheduler enforces limits on the CPU cycles that each partition is permitted to consume, guaranteeing that the minimum required CPU resources are always available for specified processes. → Fixed partitioning designs, such as ARINC 653, are inherently inefficient: spare CPU capacity in a partition cannot be temporarily borrowed by other partitions - so CPU budgets must be set in advance to anticipate peak demand. → With QNX adaptive partitioning, spare CPU capacity is used when it is available - processes can exceed their budget limits if the overall system has available cycles. When CPU resources are constrained, budgets are enforced and every part of the system gets its fair share. → Developers and integrators can isolate downloadable content to secure partitions, thwarting denial-of-service (DoS) attacks. → Malicious or unvalidated software that monopolizes system resources can't starve critical functions of CPU time. → Guaranteed CPU cycles for error detection and system-recovery operations ensures rapid system recovery. → Operators and administrators with access to the user interface - a console or a remote - can always determine the system state, regardless of processor load. → Available CPU cycles are dynamically assigned from partitions that aren't busy to partitions that can benefit from extra processing time. → Available CPU cycles always go to the highest priority, ready-to-run thread in the system. → Developers can designate critical threads as guaranteed to run regardless of partition budget and system load. → A minimum CPU budget allocated to a device's user interface can guarantee that it rapidly and invariably responds to user actions, such a button push or voice command. → CPU cycle guarantees for media players can ensure that they always get the cycles they need to deliver smooth, continuous playback - eliminating skipping or pauses in media playback. → Developers can set aside CPU budgets for individual parts of the system to ensure fair sharing of system resources, avoiding the need to normalize priority schemes across the system, which is time consuming and error prone. → Developers and integrators can monitor and reset budgets as determined by their projects' unique requirements - all without writing or even recompiling code. No extra work is required to integrate QNX adaptive partitioning technology into a system. → Adaptive partitioning can be added to a system with minimal effort - no recoding (or even recompiling) of applications is required. → Partition parameters are configured, not programmed: no code changes are necessary to implement CPU guarantees for specified processes. → Redundant services - transparent distributed processing (network distributed architecture) enables rapid building of redundant services. → Guaranteed CPU resources - adaptive partitioning guarantees minimal CPU time and memory to critical software components, ensuring that they have the resources they need under all conditions. These principles are embodied in the QNX Neutrino RTOS microkernel architecture, which ensures that a component failure is constrained to that component, and the High Availability Framework, which provides the infrastructure for fault detection and recovery. → Fault isolation - segregate failures in well-defined software components to minimize their impact on overall system availability. → Full MMU-based memory protection for all components ensures that a failure in one component cannot corrupt other components or the OS kernel. → Device drivers and system services, such networking and filesystems, can be restarted automatically without affecting other software components. The QNX High Availability Framework provides a reliable software infrastructure on which to build highly effective high availability systems. As well as supporting hardware-oriented high availability solutions, it provides developers with tools to isolate and even repair software faults before they domino through a system. With the High Availability framework, developers can quickly construct custom failure recovery scenarios, and design systems to recover quickly and transparently. → Automatic restart of failed processes - without a system rebooting. → Automatic recovery of inter-process communications following process failures. → Customized failure recovery actions, where applications identify failure conditions and perform specified activities to mitigate consequences and speed recovery. The High Availability Manager (HAM) is a "smart watchdog" - a highly resilient manager process that monitors a system and performs multi-stage recovery whenever system services or processes fail or no longer respond. As a self-monitoring manager, the HAM is resilient to internal failures. If, for whatever reason, the HAM itself is stopped abnormally, it can immediately and completely reconstruct its own state by handing over to a mirror process. The High Availability Framework includes a HAM API library, which offers a simple, thread-safe mechanism for communicating with the HAM, and a client recovery library, which provides a drop-in enhancement solution for many standard libc I/O operations. QNX Software Systems offers one of the most comprehensive networking solutions for connected and distributed systems. QNX Software Systems is continuously expanding its networking support. If you cannot find the protocols you need, please contact us for the very latest information. TDP extends the QNX message passing architecture across virtually any network interconnection technology. It provides a framework for the dynamic interconnection of hardware and software resources (message queues, filesystems, services, databases) located on remote nodes, using standard messages. Resources have true location independence: software on any node can access any published resource. QNX transparent distributed processing allows an application to access resources on any node in the network, across virtually any network interconnection technology. → Multiple cards can register for the same service. → Automatic supervision and notification of available resources. → Flexible deployment and partitioning of applications at runtime. → Inherent supports for multiple links between CPUs. If one link fails, data is automatically re-routed over the remaining links, without loss of service. → Network traffic can be load-balanced over all available links, resulting in significantly higher throughput. → Applications can specify a preferred node for data, but if a failure occurs on that node, the data is transparently load balanced over the remaining functioning nodes. Messaging for TDP operates above the transport layer. It works equally well across LANs, backplanes, proprietary switch fabrics, vehicle buses such as CAN and MOST, and even the Internet. → Processes running on a single CPU will continue to communicate with each other even if they are subsequently distributed among multiple CPUs, allowing developers to extend resources to networked nodes and simplify the development of multi-node systems. → Developers can create robust and fault-tolerant systems that offer on-demand access to resources on multiple CPUs. If a CPU is not available, a similar resource can be transparently accessed on another CPU - delivering built-in redundancy and load balancing. → When debugging, developers can query and collect remote data via a single connection to multiple cards, ensuring that data can be accessed even in the event of a broken connection. → execute outside the microkernel, in memory-protected user space. Developers can start, stop, or upgrade filesystems on the fly, without having to reboot. → are accessible through simple POSIX / C API calls: open(), read(), write(), close(), etc. → can run concurrently on the same target, and even work in concert to extend one another's capabilities. For example, the compression filesystem can work with a flash filesystem to dramatically reduce the flash memory requirements on a given target. QNX filesystems all work inside the QNX pathname space. This pathname space allows QNX systems to seamlessly access filesystems on any computer in a network. QNX systems do not even require a hard drive or a flash drive to boot. They can be designed to boot from RAM, from another machine in a network, or from flash drive offering read-only access. → Read/write persistent storage resists data corruption from an unexpected reset or a power loss. → Wear-level capability increases the life span of flash parts. ETFS transaction structure - ETFS is a power-safe filesystem composed entirely of transactions. NOR flash devices are supported with the QNX Flash Filesystem version 3 (FFSv3). Updates to metadata are handled in carefully executed sequences. This behavior allows for high filesystem integrity even after power-loss. After a reset or power-on, the filesystem is scanned, and data integrity is restored where ever possible. Sectors with errors are recorded and transparently avoided. 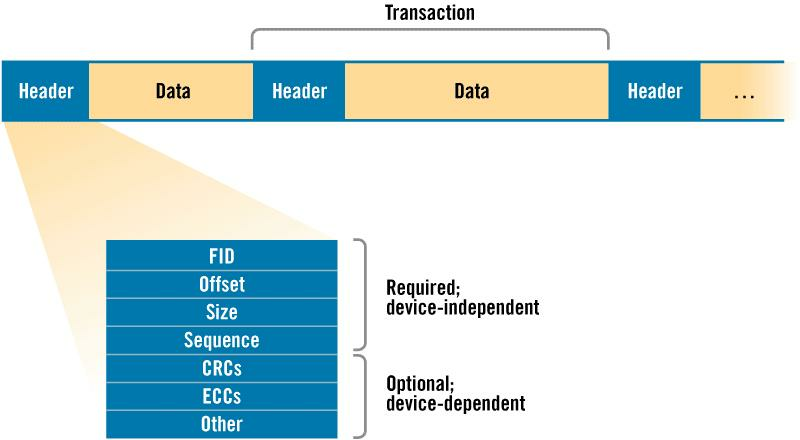 NAND flash devices are supported with Embedded Transaction Filesystem (ETFS) technology. Atomic transactions ensure integrity of file and directory operations, and resist corruptions caused power failures. → Factory-marked bad blocks are reserved and unused. → Blocks are marked for refresh before hitting the normal read degradation limit, avoiding possible ECC errors and the need to recover data. → Write buffering reduces fragmentation by consolidating small write transactions before they are written to NAND. → Background de-fragmentation runs automatically, but is automatically pre-empted by user activity. Filesystem data is not block-specific. NAND devices can be bulk copied using a separate flash program. With the QNX Neutrino RTOS, developers can easily replace standard BIOS with customised early initialisation of periphereals. Customized early initialisation can eliminate time-consuming tasks (such as initializing keyboards or USB devices) that may be superflous in embedded systems. Most x86 systems place device drivers - which are responsible for device initialization - in the BIOS. In the QNX Neutrino RTOS these drivers are outside the BIOS. This architecture allows developers to easily select which drivers and, therefore, which devices are initialized and when, removing unneeded initializations and deferring others until after the boot. In brief, work is removed or deferred to achieve the fastest possible boot times. When developing BIOS-less boots, developers can hard-code custom interrupt assignments so that they are known at compile time. They can design their systems to boot from a partial boot image boot on a linearly mapped device, such as a flash or EEPROM. This partial image can be optimized for fast boot times, but include a driver to access storage, such as a hard drive, NAND flash device or USB device with a full boot image. The QNX Neutrino RTOS's unique microkernel architecture makes it easy to optimize component and application availability following a boot to change the startup sequence to take advantage of any idle time. The system architect has complete control of what starts when. For example, developers could configure a system to play a jingle almost instantly after power-up by loading the audio driver and a small, throw-away playback utility before most other drivers. QNX Instant Device Activation enables embedded systems to meet critical early readiness requirements, such a receiving and responding to CAN bus messages, after a cold power up and boot. IDA boot process - Instant device activation brings a minidriver up before the kernel initialization to meet early boot requirements, then hands control over to the OS. QNX Software Systems offers the only full multicore solution for embedded RTOS systems on the market. 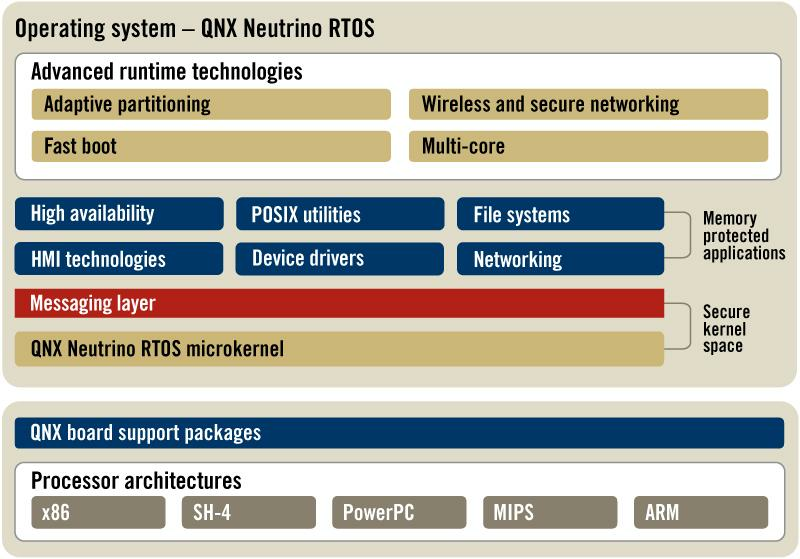 In addition to its unparalleled reliability and self-healing capabilities, the QNX Neutrino RTOS microkernel architecture offers significant advantages over monolithic kernels. QNX Software System's unique BMP technology enables developers to bind processes and threads to a specified processor without code changes. The QNX Neutrino RTOS uses multiple techniques to optimize performance on BMP systems. These techniques include soft affinity and runmasks. Whenever possible, the QNX Neutrino RTOS ensures that a thread is scheduled to run on the same CPU that it was last running on in order to improve cache performance. Each thread has a runmask; that is, a bitmask that indicates which processors the thread is permitted - or forbidden - to run on. By default, a thread inherits the runmask of its parent thread to ensure that all threads in a process are bound to the same processor. Runmasks for each thread can be changed dynamically at any time, however, as needed, if a thread or its children need to change processor. This gives the system designer the ability to fine-tuning system performance by tying threads to specific CPU cores or reserving cores for dedicated functions. The QNX Neutrino RTOS supports hundreds of POSIX commands, utilities, and programming interfaces that maximize code portability and reusability. This rich, standards-based environment includes familiar shells and command-line interfaces, and allows developers to quickly migrate Linux, Unix, and other open source programs to QNX. The QNX Neutrino RTOS was engineered from the ground up for POSIX standards. This approach eliminates the complex POSIX adaptation layer needed by other RTOSs, resulting in faster performance and lower memory costs for embedded applications. QNX Neutrino RTOS 6.5 Service Pack 1 was released in June 2012. This service pack included new enhancements to the Neutrino RTOS software. QNX Neutrino RTOS 6.5 was released in July 2010. This release included new enhancements to the core software and kernel. QNX Neutrino RTOS 6.4.1 was released in May 2009. This release included new features, as well as important bug fixes.